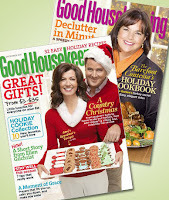 $9 for 2-year Good Housekeeping Magazine Subscription! $84 Value! Head over to Mamasource to get a great deal on a 2-year subscription to Good Housekeeping Magazine! If this is your first Mamasource purchase, use the code DEC10 at checkout to make it $9. Otherwise, it'll cost $10, which is still a great deal!